Daniel has been in the sporting field since he was a young athlete competing in rugby league, basketball, touch football and AFL. Daniel received a few injuries over the years and seeked treatment from massage therapist to maintain and help his muscles from these injuries and tightness. Daniel has studied at the Australian Institute of Fitness doing Sports and remedial massage. Daniel works at the AFL for the Greater Western Sydney Giants Development Academy. Within this academy Daniel helps with rehab, massage and general wellbeing of all players at training and or on game day. At the AFL Daniel also helps prepare the players before training for a flushing of any sore muscles or rehabbing injuries, as well as strapping. 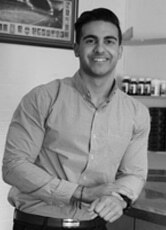 Daniel prides himself on providing a balanced treatment including; soft tissue massage, mobilisations and adjustments. This is complimented by tailored rehabilitation exercises and advice. Even though he specialises in sports injuries, Daniel’s treatments are modified for each patient and are suitable for all family members. Daniel is registered with the Massage & Myotherapy Australia. • Sports Massage: A sports massage is to help athletes avoid injuries, cool down after exertion and enhance their overall performance. Sports massages concentrate on increasing motion and flexibility, relieving muscle soreness, and promoting a quick recovery from muscle overuse. • Dry Needling: Dry Needling is an effective way of relaxing overactive muscles. This form of treatment stimulates the muscles filling it with blood which speeds up the rate of recovery. • Pregnancy: Prenatal massage can reduce the amount of stress hormones in your body. Kneading the skin can reduce edema and swelling that causes water retention in pregnant women, sending water away from your tissues and joints and into the lymphatic system. Massage also reduces nerve pain, such as leg tingling, which can commonly occur later in your pregnancy as your uterus presses on nerves in your pelvis and lower back. • Trigger Point: Myofascial trigger points represent small areas of tightness within muscles, creating tight bands and “knots” or tiny bumps from the contracted muscle fibres. • Injury Management: Commonly found in the gym are rotator cuff/ shoulder, knee, ankle, hips and lower back injuries. Rehab will help to manage these injuries and prompt longevity in training.